Man wearing waterproof boots holds a blackfish trap. Uksuarmi taugaam maani cali August-aam iluani pilaryugnarqut, nutaan-am tamakut cali nunateng, piyararrateng, uksuiyarateng, tamakunek tamaa-i can'giirnek-llu unangvik'lalteng, wall'u makunek ceturrnanek, naternanek-llu unangviktukteng ullagluki avani. Kuiggaat tamarmeng yugluteng. In fall, I think it was August, they'd move to their usual fall camps, the camps where they usually harvested blackfish, tomcod, and flounder. All the rivers were occupied by people. 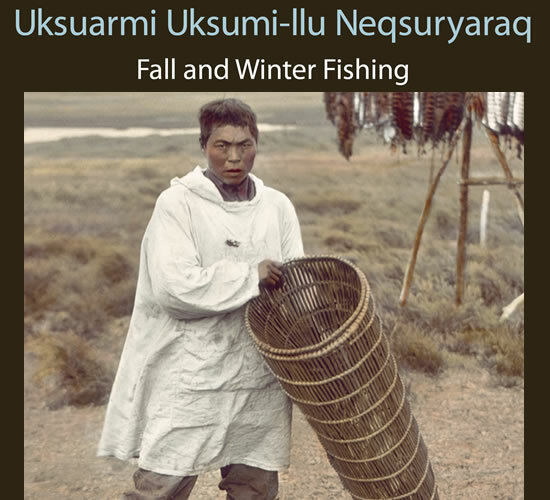 People continued to fish all through the fall and early winter, setting wooden traps and sinew nets under the ice to catch whitefish, tomcod, blackfish, pike, burbot, and needlefish. An industrious family could dry and freeze thousands of pounds--food for both themselves and their dogs. David Martin recalled, "My late grandfather told me, 'Now, not wandering off to other areas, always try to stay near these fish that never disappear.'"